Ram Leela Mela. As Performed before at Ram Nugur before the Raja of Benares. 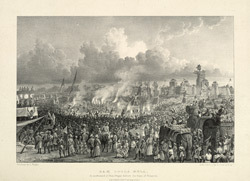 bl.uk > Online Gallery Home	> Online exhibitions	> Asia, Pacific and Africa Collections	> Ram Leela Mela. As Performed before at Ram Nugur before the Raja of Benares. Plate 4 from the third part of James Prinsep's 'Benares Illustrated'. Prinsep (1799-1840), an antiquary and colonial administrator was assay master at the Benares Mint between 1820-30. The lithographs published in this collection were based on his original sketches of the various views of the 'holy' city of the Hindus. Of this plate he writes: 'Five or six spots in the town becomes annually this season, the scene of a Ram Leela...Many of the native regiments go to considerable expense in performing the Ram Leela...The Rajah of Benares, or his estate at Ramnugur, conducts the performance in a very complete manner: really the whole of the Ramayana is read though in the course of twenty or thirty days, and whatever incidents are capable of being acted, or displayed, are simultaneously exhibited'.